LETHBRIDGE, Alta. -- Humboldt Bronco defenceman Logan Boulet was called a hero and given a standing ovation during his funeral Saturday in a southern Alberta arena after a few chants of "Logan" and "Boulet." His godfather, Neil Langevin, told thousands of people at the service in Lethbridge that everyone should get a standing ovation at least once -- based on a quote he read in the book, Wonder. "I thought since we're in a hockey rink and Logan is a great hockey player that it would be suitable for us to cheer loudly to remember my godson and our friend and our son," said Langevin. He led the crowd as one side cheered "Logan" then the other said "Boulet." They repeated the chant three times and then gave Boulet a standing ovation. Boulet, 21, was one of 16 people who died after a transport truck and a bus carrying the Humboldt junior hockey team collided over a week ago at a rural Saskatchewan intersection. His parents, Bernie and Toby, were among the first families to arrive at a Nipawin, Sask., church where people gathered after the crash. They ended up at the Royal University Hospital in Saskatoon, where Logan was kept on life support until his organs could be donated. Brian Friesen, who read two scriptures at the service, said there are six people who are still alive because of his donation. "He's a hero," said the family friend. Boulet's organ donation has also led to a national surge in people signing their donor cards. During the rest of the service, his empathy and kindness was on full display as family and friends remembered him. 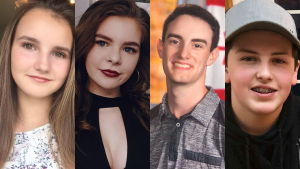 Jared Heidinger, a teacher at Lethbridge's Winston Churchill High School, said he started noticing traits in students that he wanted his own children to have. "Logan was one of those kids," he said. "Humble yet confident. Humorous but not attention seeking. Hardworking but balanced." Doug Paisley, one of Logan's minor hockey coaches, said he was always a major contributor to the team. "You talk about a team guy and team first -- that was him," he said. "I'm not sure I've ever coached a better person." Boulet was also remembered for his quick wit, his kindness and his ability to build lasting relationships. Langevin said Logan excelled at every role he took on. "He's not just a hockey guy, he's a great guy," he said. Several displays were set up at the arena, including one at the entryway with dozens of hockey sticks tied with green and yellow ribbons -- similar to a social media movement that saw people putting sticks on their front steps to support the team. Another one was set up near the concession stand with one of Boulet's official Broncos photos. A third display on the stage had a table with all of his hockey jerseys since he was a boy, some books and his graduation cap. 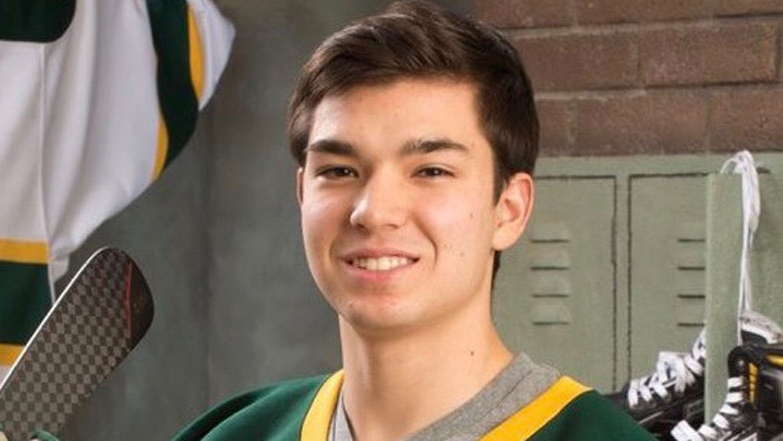 Logan Boulet, 21, died in the Humboldt Broncos bus crash in Saskatchewan on Friday, April 6, 2018.